A few days prior to the big announcement of the Foleo, Palm trotted out brief a press release announcing the availability of the latest in a long line of Palm-branded accessory keyboards. Despite bearing a generic mouthful of a title: the Palm Wireless Keyboard with Bluetooth Wireless Technology, this new keyboard is a surprisingly strong entry into a field that’s far less crowded than it was a few years ago. These sorts of keyboards (from Palm and other manufacturers) were quite popular during the PDA heyday, especially among heavy note-takers, writers and the poor souls who could never get the hang of Graffiti. I’ve almost always had some version of Palm keyboard ever since my Palm Vx days, either from Palm, ThinkOutside, or the classic Landware GoType travel keyboard. However, ever since Palm began phasing out the Universal Connector and the plugged-in keyboards, my interest in such things has waned. I figured that the time was right to see what improvements Palm had brought to the table for a rather staid product category like portable wireless keyboards. The keyboard is currently available from Palm.com for $99.95. 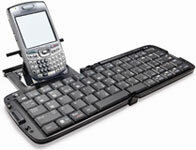 Palm lists the keyboard as being compatible with the Treo 680, 650, 700, and 750 smartphones. Drivers for both Palm OS-based Treos as well as the Windows Mobile Treos are included on the bundled software CD or downloadable from Palm. The recently released Treo 755p, Palm’s latest Palm OS-based Treo for CDMA networks, is strangely not on the supported device list. My limited testing with the Treo 755p revealed no problems. Palm curiously lists just two handhelds as compatible with this keyboard, the Tungsten E2 and the Palm TX. Relatively recent Bluetooth-enabled Palm handhelds such as the LifeDrive, T5, T3, and Zire 72 are not mentioned as compatible devices. I was unfortunately unable to acquire any older Bluetooth-equipped Palm devices for the testing period. The keyboard comes in Palm’s usual electric orange blister packaging. It’s eye-catching and perfectly suited for display at retail. I did find myself hard-pressed to distinguish this particular keyboard revision from the slew of earlier devices all bearing similar but slightly different names, packaging, and capabilities. I again risked life and limb opening the package to extract the keyboard and the rest of the package contents. Tip: The Black and Decker Powered Scissor is the finest household gadget I’ve bought in years. Anyone who frequents membership warehouses like Sam’s or Costco owes it to themselves to buy one of these suckers to slice through all manner of tamper-proof packaging. Thanks to my handy power scissors, I didn’t slice off a finger and impair my ability to review the Palm keyboard. Aside from the actual keyboard, the box’s contents are pretty sparse: the usual multi-language Palm instruction booklet and warranty information and two Duracell AAA batteries. I was very pleased to find that the high standard set by most of the recent Palm-branded accessories continues here. Palm has really ramped up their standards when picking accessory and peripheral manufacturers (see my Palm GPS Navigator Smartphone Edition review) and their new keyboard continues this fine trend. This keyboard is not built like a tank as my old Palm V keyboard was but it’s much lighter and still appears quite well-constructed. The exterior black plastic is sleek and nicely textured. The little embossed “Palm” and “Bluetooth” made for nice, understated branding. No bling here, folks! The good news continued after I pressed the black button on the side to open the keyboard. I was pleased to see the preferred layout of five rows of keys with a dedicated numeric line across the top. Small but tough rubber feet adorn each side of the keyboard when it is open, so as long as you are typing on a flat desk or tabletop, the keyboard refrains from wobbling or rattling.I tested it skid-free on a high-glass wooden office desk, a glass coffee table, and several kitchen countertops. Two AAA batteries reside in the upper right-hand side of the keyboard hinge, concealed under a small removable panel. I typed a quick half-page e-mail and immediately knew I could get used to keeping this thing around the house or the office. It would certainly make for a solid travel companion! The one thing I can caution prospective Palm keyboard purchasers about is the somewhat precarious positioning of the device on the easel. With no side arms or fingers to hold the device in place, a slight bump or rattled tabletop can cause your pricey Palm device to go scattering off of its easel and across the table or onto the floor. Palm fortunately did see fit to include some thin rubber strips on the bottom panel and top rail of the easel. Still, I’d really have liked to have seen some sort of mechanism to prevent sudden, potentially dangerous lateral movements by the PDA or smartphone (see my additional thoughts on this in the section below). Palm should definitely address this in future product revisions. Since the keyboard’s easel is an entirely separate piece that can be removed completely from the keyboard it would not be a difficult item to retrofit or replace should circumstances necessitate this. The handful of wireless IR and Bluetooth keyboards I’ve owned over the past few years have generally been plagued with sluggishness, battery hassles and general driver or connectivity aggravation. This keyboard thankfully exhibited none of this behavior and was a delight to use in every way. Despite my 700p’s perpetual lag, I never was able to out-type the keyboard. Its Bluetooth signal’s range allowed comfort placement of the easel + Palm device nearly anywhere. By far the highlight of the entire package is the removable easel. The tilt of the PDA/smartphone in use is adjustable to one of the three different positions via a metal bracket and notches located on the underside of the easel. A height-adjustable rear panel with a thin foam stripe running horizontally provides additional support for the taller Palm PDAs. Though the easel does feel a bit fragile when being extracted from the keyboard, it seems reasonably well-built and should survive the rigors of long term usage, assuming proper care is taken when removing and reinserting it into the keyboard. I’ve always felt that composing lengthy e-mails and word processing documents was an enormous choir in any handheld device. While that is still mostly true, I had my best-ever experience in handheld word processing when using this keyboard with a TX on the detached easel running Documents to Go in landscape mode. The new Treo 680/750/755 formfactor posed no problems in regards to stability or positioning on the keyboard’s easel. Of the three devices immediately at my disposal (700p, 755p, TX), the TX seemed the best fit on the easel due to its relatively flat and wide base. I did find my TX to be considerably more stable than any of my other devices, especially when in landscape mode. It even worked with my Sena flip case still on the TX! And my 700p with its Seidio 3200mAh “rumpshaker” battery was a tad more stable than the stock 755p. I imagine a LifeDrive would fit nearly perfectly on this little stand. This is one instance where it helps to have an older, bigger, and heavier Palm device! I installed the driver included on the bundled software CD on my 700p and began testing. I also checked Palm.com for a newer downloadable driver but the website mirrors the CD’s 1.1.0.8 version. BTKeybrd.prc takes up 67k of main memory. While the 755p is not yet officially supported by the keyboard’s driver, in my limited testing time with the new 755p, I encountered no issues whatsoever. The 755p and the 700p behaved identically under these Bluetooth conditions. The TX also had no issues with being simultaneously online via wi-fi and connected to this keyboard and typing via Bluetooth. The actual keyboard driver/configuration utility appears in the launcher as “BTKeybrd” and has a different icon from earlier Palm IR keyboards. The usual onscreen options are offered in the main configuration screen: Status on/off, sound on/off, Delay until repeat and keyboard repeat rate. A single line to use for test typing is available at the bottom of the screen. The next submenus of the configuration utility are the “CmdKeys” section where application shortcut assignments can be generated. Up to 9 different command key shortcuts be entered. None are enabled by default and a “default” key can always restore the original settings if necessary. A useful (albeit barebones) Help menu appears next. This screen basically gives a list of the relevant function key shortcuts (Fn + whatever) and their associated function. The help menu also lists the command + navigational key shortcuts to mimic the function of the Palm device’s built-in 5-way Navigator. I actually found the navigational aspect of the Palm Bluetooth keyboard its most confusing aspect. I am used to quickly cycling through menus with the Palm 5-way Navigator directional pad. Having to hold down a command button on the keyboard prior to pressing an arrow key is counter-intuitive to both Palm and desktop PC logic. I understand that a downsized keyboard such as this will always entail numerous compromises but for users editing large documents or with a long list of applications to scroll through on the launcher, it can be aggravating to think the keyboard is suddenly unresponsive prior to the realization that the command key must be held down to move around onscreen. The usual “About” menu is the final screen available in the BTkeyboard app. No surprises here. Despite a history of quirky Bluetooth drivers under Palm OS 5.x, I had no issues whatsoever while testing this keyboard with a Treo 755, 700p and Palm TX. I did get one random reset when launching Blazer from the keyboard shortcut key on my 700p but I attribute that to the 700p’s general unreliability and Bluetooth issues. Unlike my Palm Bluetooth headset, the 700p never dropped the connection with the keyboard. Activating the driver app on each Palm device does require a quick power-up/pairing process performed by holding down the Bluetooth icon button on the top left corner of the keyboard. Strangely, the Bluetooth indicator light on the keyboard is a bright amber instead of blue. Palm devices can be charged while using keyboard. This was difficult with earlier IR keyboards and usually impossible with direct-connect keyboards. The multi-colored key font is a bit thin and is hard to read in dim lighting conditions. Palm has once again managed to hit a home run with an accessory release. This Bluetooth keyboard is simply the finest experience I have ever had with a wireless portable keyboard. All of their issues that plagued earlier, pricier Bluetooth ‘boards have seemingly been resolved. At the same time Palm has bundled a solid driver and configuration utility and introduced a few novel twists into the overall user experience. Aside from the lack of any side supports to keep overly wobbly Treos secure on the easel, I can find very few faults with this keyboard. Of course, I’ve only had the keyboard to test for one week but the initial signs are highly encouraging that this is a definite keeper. The Zen of Palm is still alive and kicking with this simple yet elegantly designed accessory. It would be a very wise move indeed for Palm to begin bundling this particular keyboard with the E2 or TX handhelds and package them with an updated version of Documents To Go as a more highly portable alternative to the Foleo. For users wishing to combine affordability with serious mobility, this keyboard plus a Palm TX makes for a true mobile manager. Someone somewhere already posted a link to the third-party manufactured keyboard - unfortunately, I forget where (TreoCentral? )...one moment while I google everywhere...found it! That is to say, PALM didn't a home run, they didn't even hit the ball; they used a pinch-hitter. Seldy, a very large majority of Palm's accessories are rebranded devices or special palm exclusive packages. But saying =PALM= hit a home run and "the Zen of PALM is still alive and kicking with this simple yet elegantly designed accessory. " is a little too much credit in the wrong place, no? Thanks for the B&D Power Scissors tip, Kris. Those do sound like they could save on blister-package-induced emergency room trips! I don't understand why the Shift and "?" keys have such odd placement on this keyboard. Yup, they are great little gadgets. I've used to slice through so many types of packaging (I used to use either a Swiss Army Knife or any number of deadly kitchen/steak knives) that this thing has become the handiest gadget in the house. I also had trouble with the placement of those keys (plus a few others). Depending on the lighting situation, the keyboard lettering can be really hard to see...sort of a light sky blue for some characters and a faint peachy-tan color for alternate symbols. But it's all (mostly) mitigated by the stable driver, versatile easel positioning and the small touches like the onscreen battery indicator and the ton of keyboard shortcuts & functions. does anyone really need this product? i have to bang out a lot of emails and i've always felt that these keyboard contraptions seem silly and cumbersome. maybe useful if you're a professional writer but then why not just carry a mini-latop? where/why/in what do you guys carry all these junk accessories? Only with the advent of new BT versions on Palm's new products, a BT keyboard is useful. It's not really smart to have the only BT channel on your Palm blocked by a keyboard, effectively locking out other BT accessoires. As always, I agree with you. The last Palm BT keyboard I had with my T3. After all the little settings and tinkering needed each time I set it up, I decided it was not worth it. Docs2Go was an absolute joke and the all the special shifts and functions to get that guy operating right was too much, especially with non-standard chars. Once I hacked through all the little cumbersome issues, I could type great. Eventually I realized that my G2 speed was much faster beginning to end. It felt like spending $100 on 1 cheap screen printed shirt. $95 and an hour for setup of the screen, then and $5 and 17 seconds for the shirt. Didn't make sense for me. eBayed it and never looked back. I could see it for long articles or authors with a lot of standard text. But as you say, laptop (or of course Foleo) is much much better. A Palms use BT 2.0 for multi connex, now right? Afterall it is 2007. Treo + Fooleo: $600 (-$100) = $500 for "larger screen" and "full sized keyboard"
I think this BT keyb is a smart product. The general rule is you don't lug around a keyb unless you plan on going someplace and you want to get a lot of typing work done. This keyb folds and you can throw it anywhere. It is specialized and useful for those times you need a full keyb. Much smarter and more flexible/compact/light than a dumb Foleo. As for the screen, they simply need to make a new handheld that uses near 100% of the area for the screen, put the buttons on the side and throw in a cell chip for voice. The first good news from the new PalmApple team about making a decent handheld and I plan to buy the above keyb. Right now, Im using my TX while I have Palm on probation. And put a 640x480 screen. Hires lessens eye strain and allows people to see very small letters and graphics. A smart way to improve the visual experience and promote mobile computing. Might required a dedicated video graphics chip. Which is way overdue by the way. By the way, I dont all keybs should be white/beige. Its boosts visibility and useability in dim light conditions. Success is found in little details like that. and having a keyb seperate allows you to buy a new one if it breaks. If you have a Foleo, you have to return it to Palm for repair and there is downtime and concerns about getting back a bad refurb. A separate keyb empowers a consumer. It allows you to choose among different brands, colors, shapes, technologies and prices. Does anyone else feel sad/guilty for the things they said about Hawkins and his Foleo? Hawkins brought us the pilot and he counted the taps in the Palm OS PIM, which I still depend on today. As useless as I feel the Foleo is, I really feel bad talking bad about Hawins :( he really seems to have his heart into it. Anyways, I hope it succeeds and he proves many of us wrong, but I doubt it. Jeff Hawkins made $100+ Million - he don't care about you, why care about him? Hawkins made $100 million because he cares enough to give enough people enough stuff they're willing to buy from him to the point that he earned $100 million. His stuff isn't the best (rueful chuckle), but it's good enough that I've found it worth buying and you probably have too since you're reading this. Does this keyboard support useful keystrokes like Ctrl-left/right arrow (or whatever) to skip through text by words, instead of characters or to the end of lines? My ThinkOutside BT keyboard doesn't, now; I assume it's the driver's fault, but no version of their driver ever gave me such support in DTG8, although earlier versions worked in WordSmith (but not now). My old direct connection Palm folding keyboard for my T2, however, always worked flawlessly: good keyboard, no need for batteries, functional keystroke combinations in most applications, no dropped BT connections. If only the T2 had had WiFi and a big memory slab. Maybe Palm should just change their name to "If Only." "Hawkins made $100 million because he cares enough to give enough people enough stuff they're willing to buy from him to the point that he earned $100 million." Get it right, he used to care when they were starting out. If he did care, we wouldn't be losing features when upgrading to a newer model. Everyone seems to forget about software keyboard solutions. is by far the fastest and error free way to enter text on a PDA/Smartphone. Unfortunately I have not yet been able to convince the makers of WordLogic to make a Palm OS version of the PPC version. Kris, thanks for the write up. David asked about key placement above, and I think you are being way to nice to Palm about this. Maybe you don't often type a question mark, but I guess I must do it too often. The placement of the up arrow and question mark keys is frustrating beyond acceptable to me. I've written about it elsewhere, and people should be warned about this before they buy this keyboard and the IR Universal Keyboard from Palm. I get ready to hit the question mark key for punctuation and instead hold down the shift and hit the up arrow key. Now I have marked all of the text from the end of my sentence up to the previous line of text. I hit the space bar to begin typing my next sentence and all of that marked text gets deleted. Because I don't necessarily look at my screen when I type (why should I, particularly when I am taking notes in a meeting), I don't even notice what has happened until much later. Honestly I think it is just a dumb idea. There is much less standardization of the arrow key placement on keyboards than the question mark key. If I am going to hit an arrow key, I am much more likely to go looking for those keys before I hit them. I don't naturally go looking for a question mark key because its placement has been standard "forever". Ok, I'm done ranting. But I do think people should be warned to look specifically at that issue before they plunk down $100 for a keyboard. Maybe they won't think it is a big deal, but maybe they will. Wow, PIC is a tough crowd to please.....a few days ago I was slagged by Dr. O for being overly harsh and a Palm-pessimist. Now I'm getting scolded by Ron for being TOO nice to Palm. I think my past posts will shows that I am anything BUT a Palm apologist/astroturfer. But I see your point and certainly realize that different people will have their own likes,dislikes and quirks when using certain products. Thanks for the comments and questions, everyone. In all fairness, I've been impressed by three of Palm's rebranded/repackaged accessory offerings (the Pan Stylus, the GPS Navigator Smartphone kit, the BT keyboard) than any of their handhelds or smartphones of the past few years. That's just how I see it---more value and quality for the relative askng price for certain Palm accessories than the actual Palm devices themselves. This is probably due in no small part to Palm NOT having a large role in the design or construction of these "dumb" devices. Also, I guess I should preface everything with a statement that I applaud the new Palm keyboard based on its performance relative to other portable, "almost full sized" travel keyboards. If I were to compare it to the Microsoft Natural 4000 Ergo keyboard (2nd best keyboard I've ever used behind the original beige MS Natural) I'm typing on right now the Palm BT 'board would get a 0/5. But as Einstein said, everything's relative and I feel the new Palm BT 'board has the best combination of driver/software support, size, build quality, features, and typing response. 'Nuff said. Granted, I only had a week with it while conducting my review and did not take it on any extended trips or anything. And it's no great secret that I simply type slower and more carefully on portable keyboards than I do on my desktop's full-size keyboard or even my laptop. So I just slow things down and try to type more deliberately to avouid the sorts of mishaps Ron mentions. Since I'm such an opinionated sort, I guess I don't type question marks nearly as often as other punctuation marks, huh? ;-) And I still take notes during meetings with pen & pad (to minimize the distraction factor). Now I'm getting scolded by Ron for being TOO nice to Palm. Ok, maybe I was a bit harsh. But my "scolding" honestly was aimed at Palm, not you. You do a great job with all your contributions to this site. So I just slow things down and try to type more deliberately to avouid the sorts of mishaps Ron mentions. I don't normaly wave the flag for M$ products, but this is simply the FINEST keyboard on the market at ANY price, regardless of manufacturer. The only thing that could make it truly perfect would be if it came in a cordless version. This keyboard does not work well with the 755p. Left and Right Arrows do not work for navigating at all. Depressing some keys individually or in combination e.g. DEL will cause a reboot causing you to have to reconnect Bluetooth. Barely works with Docs2Go. It needs its own driver - until then its a boat anchor. I really like to use a keyboard with my TX; I find it very helpful for meetings. I originally used the IR keyboard from Palm, but it didn't last much more than a year before I started losing keys. I like the look and feel for the Bluetooth version much better. However (a big however) I have lost a great deal of info because of a reboot problem that has been plaguing me when using this keyboard with Docs2Go. I always disable my WiFi radio first and that helps some, but can anyone else offer to more tips to overcome this issue? It only occurs with the keyboard connected. Sounds like you're using up all of your TX's heap/cache memory. Try either resetting the device (I know it's a pain, but...) every so often when it's convenient to see if this reduces the frequency of unwanted resets. Also, are you using the TX in portrait or landscape mode when using the keyboard? I've generally experienced more wackiness with certain Palm devices (T3, TX, LifeDrive) when in landscape mode vs. the "native" portrait mode. Also, are all of your keyboard's driver settings at the defaults or have you altered anything drastically? Finally, make sure you don't have any remnants of older BT keyboard drivers, such as the old ThinkOutside BT keyboard or an old Palm IR keyboard driver (which you indicated you previously used) or anything like that. If all else fails, it might be helpful to just do a hard reset and restore all of your PIM data and then reload the newest versions of all of your apps one by one one to make sure there are no other apps guilty of causing the resets. Palm Bluetooth Keyboard - PS3 compatible? Do you know if this keyboard would also work with the PS3?